Warrior Dai Grepher appears in this card's artwork. 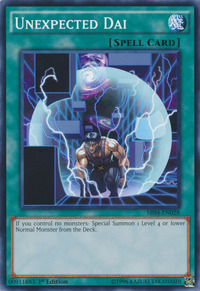 This card's artwork is a reference to the scenes in the Terminator films where the Terminator antagonist first appears in the current time period in which the films are set, kneeling in a blue energy sphere that dissolves any foreign objects within its radius. The name of this card in Japanese is a pun. The Japanese word for unexpected is Yosōgai (予想外), where the 外 has the same pronunciation as guy.